See Business of Healthcare www.BOHseries.com for more interviews with healthcare leaders and influencers. Mako Medical Laboratories provides clinical laboratory services primarily in partnership with independent physicians, 50,000 of whom they report use their high-service, mission-oriented value proposition. Founders Chad Price and Josh Arant began with no healthcare industry experience. Price, who is Chief Executive Officer for privately-held Mako Medical, shared his vision with host Matthew Hanis as part of the North Carolina Medical Group Management Association’s BOH series. BOH was founded as a forum and information exchange for the 40,000 decision-makers leading hospitals and health systems, physician practices, pharma, device, and senior living as well as government and commercial payers. These leaders, and innovators serving them, join Business of Healthcare interviews to solve the complex issues they face together. Interviews published in the Business of Healthcare (BOH) and North Carolina Medical Group Management Association (NCMGMA) interview series contains the expressed opinions and experiences of the interview subjects and do not necessarily represent the position of NCMGMA. Next month’s interview will feature Jeff James, Chief Executive Officer of Wilmington Health. As we start another year, I want to take this opportunity to thank everyone who is part of the NCMGMA for your time and dedication to the healthcare industry. We are 800+ strong and I am honored to serve as your 2019 President. It truly takes a village to meet the challenges we face in healthcare each and every day. Board and committee focus on new member engagement and retention of our current membership. Exploring alternative revenue sources for NCMGMA that will bring additional value to our members. Reviewing our current organizational structure to determine if it meets our operational needs. Remaining a resource for our 13 active committees, 9 local NCMGMA Chapters, and numerous task force groups. Reviewing our Partnership Affiliation with MGMA National to ensure this relationship continues to meet the needs of our organization. We are a very fortunate organization. Our members put forth countless hours of service, bringing important perspective on the work we do on behalf of our patients and providers, while serving our common mission with selfless dedication. Our Alliance Sponsors provide a wealth of opportunity and support for our leadership and membership to learn and grow, both on an individual level and as an organization. Our management company, TH Mgmt., Inc., keeps our team focused and organized on the issues at hand. 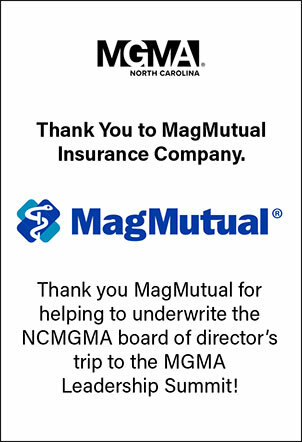 It feels good knowing all of the right pieces are in place to ensure the continued success of NCMGMA. Lastly, I want to highlight our new collaborative series with Business of Healthcare! These interviews, conducted by Matt Hanis, further our mission to provide continuing education to our members while highlighting key players and issues in the North Carolina healthcare industry. If you haven’t seen this interview yet, please click here to view. In closing, I am excited about the year ahead of us, the opportunities we will have, and the challenges we will face together.